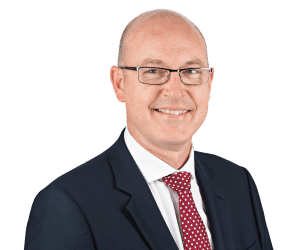 Lee Hart is a Partner and Tier 1 ranked lawyer in our accredited Personal Injury team specialising in high value catastrophic injury and fatal accident claims. Lee’s expertise includes working closely with seriously injured people and their families, leading them through the claims process and ensuring they get the best treatment, rehabilitation and care so that they can get their lives back on track as quickly as possible. Lee is a member of Headway, the Spinal Injuries Association and is an accredited Senior Litigator and Brain Injury Specialist within the Association of Personal Injury Lawyers. Find out what our clients say about Lee. J: recovered substantial damages for a lady who suffered a cardiac arrest and subsequent hypoxic brain injury after coming into contact with an electric fence surrounding a farmer’s field. W: recovered £1.5m for a lady who suffered a brachial plexus injury, resulting in severe chronic pain, after a van driver opened his door in stationary traffic on the M25 motorway, knocking her from her motorbike as she filtered through the traffic. W: representing a man who suffered a traumatic amputation of his thumb when using a lathe at work. Lee has helped to secure rehabilitation and interim payments to fund a silicone partial hand prosthesis and a more functional i-limb digit which has improved the client’s ability to carry out day to day tasks. J: consulted in relation to a potential claim against the RFU after a player was injured at an England training camp. B: represented the family of a man who died in the M5 motorway collision in Somerset in November 2011, when 7 people tragically lost their lives and many more were seriously injured after smoke from a nearby firework display combined with fog to significantly restrict vision on the motorway. Lee represented the family at the Inquest into the deaths and in successfully recovering compensation for the dependents of the deceased.